Do you lack a strong sense of purpose? Are you simply going through with the motions of the mundane? Do you want more out of life? If so, you have come to the right place. The Self-Mastery Plan is your guide to living a meaningful life. Grounded in a deep purpose, you'll experience more fulfillment, happiness, and success in your life. Because we live in a world that's overflowed with tons of information, it's easy to get distracted from our mission. From the second we are born, our life has already been written out for us by society. However, that fixed script is not for everyone. You do not have to follow society's formula if you don't want to. You are ultimately the decision maker and creator of your life. Warning: Do not expect listening to this guide will magically make your life become amazing. It will take a ton of dedicated work - continuous learning and practicing your craft. But if you're willing to put in the time and effort, you will create a beautiful and vibrant life. Let this audio be the catalyst you need to build the life of your dreams. Your time is now! Your life cannot wait! 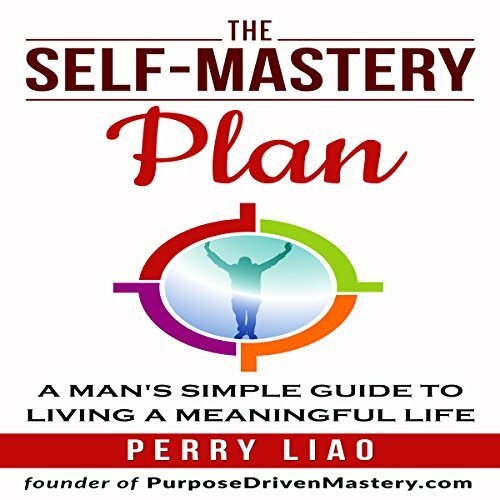 As a mid-twenty year old man who recently just started to place high value in my own growth, “The Self-Mastery Plan” by Perry Liao has provided simple clarity, direction, and sometimes just a good refresher to multiple areas in my life where I am “just winging it” - such as health, careers, relationship with men AND women, and more. The only reason I gave one less star for “Performance” is because of the audio quality. Other than that, it really is a simple guide to help the men out there who are seeking to live a meaningful and happy life. Great read, not just for men! I listened to the audio version of this a little while back after it's release since I'm always on the go. A friend had recommended it to me and had asked my thoughts, since I work in the self-care and wellness industry. Much to my surprise, the book was incredibly insightful and though it features the description, "A MAN'S SIMPLE GUIDE TO LIVING A MEANINGFUL LIFE" it really is applicable to any and everyone. The book covers a variety of topics to focus on, whether dealing with the mental, physical, emotional, or spiritual self. The author even goes as far as to give a brief summary about breaking down how good nutrition can affect you (good vs bad carbs, how certain grains and proteins affect energy levels, etc) so you even know what to shop for when wanting to fuel your body with nutrient-rich foods. As both a doctor and a busy person, I really appreciated his simple explanations so virtually everything he spoke about could be easily understood no matter what your background or familiarity with self care. Really didn't take much time to read, and the information provided is both helpful and accurate. I have a strong appreciation for those who want to share their knowledge as well as want to help others. The author starts the book telling stories about his past and his current journey. Learning about his struggles and adversity inspired me to focus on some of my own (like getting over my phobia of water and learning how to swim!). He's genuine and honest--you can tell in the writing. His advice on interpersonal communication and finding/representing your most authentic self is really motivating. It all is very helpful in all relationships, whether for work environments, romance, or simply meeting people for the first time. I particularly liked the audio version of the book because the author himself narrates it, so you really do get a better understanding of his message when you hear his tone of voice and emotion through the audio. I highly recommend this work to EVERYONE and hopefully I'll be lucky enough to go to one of his speaking events someday!